The first look at the philosophy behind the Captain America comics and movies, publishing in advance of the movie release of Captain America: The Winter Solider in April 2014. 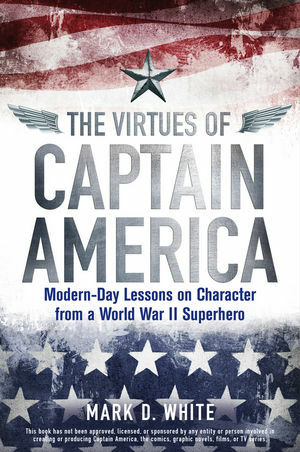 In The Virtues of Captain America, philosopher and long-time comics fan Mark D. White argues that the core principles, compassion, and judgment exhibited by the 1940’s comic book character Captain America remain relevant to the modern world. Simply put, "Cap" embodies many of the classical virtues that have been important to us since the days of the ancient Greeks: honesty, courage, loyalty, perseverance, and, perhaps most importantly, honor. Full of entertaining examples from more than 50 years of comic books, White offers some serious philosophical discussions of everyone’s favorite patriot in a light-hearted and accessible way. Publishing in advance of Captain America: The Winter Soldier out in April 2014. Mark D. White is Professor and Chair of the Department of Philosophy at the College of Staten Island/CUNY and co-editor of Batman and Philosophy. “Black-and-White” or Red, White, and Blue?